Please stand beside the First Amendment and independent journalists....wherever they are. I'm assuming Human Rights Watch is the best place to contact in order to show your support for Badawi. Please do. Also, Amnesty International may be a resource. The First Amendment is a million times more powerful than the Second. Change, "democracy", happens through voices speaking truth to power. Be it America...Saudi Arabia...anywhere. You can't create a true democracy, or even maintain one, without freedom of speech. Every other attempt at democracy is a farce. Saudi Arabia is nowhere close to a democracy yet we consider them an ally. 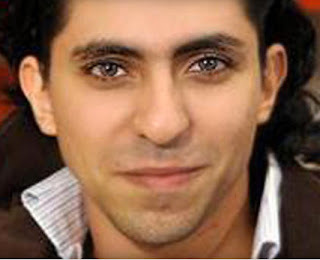 As friends, the U.S. should formally ask the House of Saud to release Raif Badawi from prison. And we should also invite them to join humanity in the 21st century...right after we perform a gut check. I don't know if the US has the moral authority to ask the House of Saud to do the right thing. They throw a blogger in prison and flog him for encouraging religious debate. When one of our intelligence analysts blows the whistle on the US blowing away journalists int he field, we hold him in solitary for a year, then sentence him to life in prison. If there is such a thing as humanity in the 21st century, I'm not sure that we're a part of it anymore than they are.